Ms. Seger has written a great resource book for writers. The book contains interviews with many top film and television writers, Moonlighting's Carl Sautter being one of them. Sautter contributed to several chapters of the book many times using illustrations from "Moonlighting" to make a point. Below are excerpts from Chapter 5 of Seger's book, wherein we learn a lot about how the couple chemistry is crafted by the writer. Sautter's direct quotes are in bold. Characters rarely exist alone-they exist in relationships. Aside from an occasional one-character story (for instance, Krapp's Last Tape, by Samuel Beckett, or Duel, by Steven Spielberg), most stories are about the interaction between people. For many films and television series, the dynamic between the characters can be as important as any individual character quality. Novelist Leonard Tourney emphasizes the change in focus in the twentieth century. "Couples have become increasingly important in fiction and film. There are innumerable stories with partners-police partners, husband-and-wife teams. It introduces into the story a kind of chemistry, creates a new person, a new identity, something new. When you put any two people or objects together, you have a new thing. People as couples are different from the individual. It's not conscious, but couples tend to behave differently when they're together." Some of the most successful films and television series have featured two stars, not one. A partial list of relational television series would include "Cheers", "Kate and Allie", "Moonlighting", "Mork and Mindy", "Starsky and Hutch", "Cagney and Lacey", and "Remington Steele." Many successful films also emphasize character relationships. Think of The African Queen, Butch Cassidy and the Sundance Kid, Adam's Rib, 48 HRS, Lethal Weapon, and Rain Man. Characters have something in common that brings them together. This is the attraction between the characters. There is a conflict between the characters that threatens to pull them apart and that provides much of the drama-and sometimes the comedy-in a script. Characters have contrasting qualities; they are opposites. This creates new conflicts and strengthens the characters through opposition. The characters have the potential to transform each other-for better or for worse. How Do You Balance Attraction And Conflict? Conflict is an essential element in almost all fiction writing. Most stories rely on conflict to provide tension and interest and drama to the story. But many stories are also love stories-portraying the attraction between people. In films and novels it is relatively easy to find the balance between conflict and attraction. Conflict begins the story but gets resolved at the end, usually leading to the happy ending. But the television series presents a special problem. A series may run for five to ten years, delaying the resolution of the relationship. If the attraction overcomes the conflict, and the characters come together too soon, the sizzle can leave the show. If there's too much conflict, and too little attraction, characters can become unlikable, and audiences will tune them out. This is further complicated because it's unnatural to keep characters apart, particularly when the strength of the series depends on the characters' mutual interest. Finding this balance becomes a challenge for producers and writers. The repartee between Maddie and David on "Moonlighting"--and their fantasies of each other--reveal feelings that they usually are unable to express directly. In this scene, from the script of "It's a Wonderful Job" by Carl Sautter and Debra Frank, Maddie is a ghost, seeing what life would have been like if she had closed the agency two years ago. Albert is her guardian angel, taking her through this experience. David is ready to marry Cheryl Tiegs, yet he can't get Maddie out of his mind. Although David can't hear or see her, she responds to his musings. I was just thinking....Maddie Hayes...That was a name I hadn't heard for a while. She slapped me once. She was even a great slapper....There was something...she had class, strength. I really admired her. She had this softness about her, this warmth. It was just a feeling. I bet she was a really special girl. Oh, David. What does he mean, was? Maybe, we could have been great together. But we were great together...don't you remember all those cases? The disc jockey, the piano player, that stupid portrait of me. You followed me to Buenos Aires...I followed you to New York. How could you forget that? You even kissed me once in a garage. All that went away when you closed the agency. Those two years, they're gone. Ah, this is crazy. Here I am comparing Cheryl to a woman I don't even know. In another situation, this attraction would be the focus of the show, and you might see a 1950s love story where the characters fall in love, get married, and have babies. But in order to keep the characters apart in a credible way, barriers are created. Usually the barrier comes from the situation-such as working relationship. Whether this relationship is a working partnership (as in "Moonlighting"), or an employer-employee relationship (as in "Cheers" or "Who's the Boss? "), the barrier works because at least one character recognizes the problems that can occur by mixing business and pleasure. Constructing the barrier can be difficult. It needs to be weak enough so that a great deal of love and affection can flow back and forth, but strong enough so at least one character understands the value of not giving in. In "Who's the Boss?" both characters have that same value. They might be attracted to each other, but as long as they live in the same house with the children, they won't sleep together. In "Cheers," Diane (and later Rebecca) is doubly determined not to give in to Sam's amorous advances. In these series, the barrier is always toyed with. Usually the titillation comes from playing with these boundaries, although if there's too much toying with them, audiences might question the indecisiveness of the characters. On the other hand, if there is none, audiences might question why two attractive people are so uninterested in each other. ...Although the situation serves to keep characters apart, individual character traits also contribute. Angela's sense of propriety raises questions about how far to go with Tony. Diane's intellectualism and snobbishness lead her to believe that she's above falling for Sam's lines. Maddie's fear of involvement keeps her from giving in to David. Contrast--more than any other quality--defines character duos. Opposites truly do attract and by contrasting two characters, the strongest character dynamics are achieved. Lethal Weapon, 48 HRS, The Odd Couple, Shoot to Kill, Someone to Watch Over Me-any relational story that comes to mind, whether a romance, a partnership, or a friendship, will probably contain contrasting characters. Contrast can reflect behavior and attitudes�Sometimes the contrast is psychological. 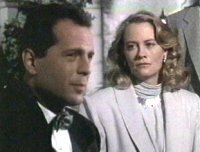 In "Moonlighting," the contrast between Maddie and David can be described in terms of inner fears, as well as outer characteristics. Certainly on the surface they're very different. Carl Sautter: "She's ice, he's hot. Maddie is a bubble detached from her emotions, while David's emotions are very raw and on the surface. He's much more a man of the moment. The thing they're most afraid of is falling in love with somebody-being exposed. But they deal with this differently. Maddie protects herself with the incredible way she looks and the coldness of her exterior. David protects himself with the fast-talking jive. So, immediately, what you've got are two characters who happen to have an enormous bond going on underneath and so you start to get that push-pull in their relationship. "Some of their contrasts are unexpected. We did a show where they got into a discussion about God. And the obvious choice, given the focus of those characters, is that Maddie would be very prim and proper in her belief in God and David would be very irreverent about it. Glenn Caron (the creator of the show) said, "No, let's layer them by giving them exactly the opposite attitudes." And he switched their attitudes and made David the one who is religious and believes in God, and Maddie the one who is very skeptical. Which worked so much better than the other-because it's not the switch you expect in it. "You see differences in how they both react to a client. In one episode that Debra Frank and I wrote, this woman walks in and says she's a leprechaun. David instantly wants to believe her, and Maddie thinks she's nuts. They have different attitudes toward life. In this episode, Maddie says to David, "You have no poetry in your soul. You're crass and illiterate"-and basically David's retort was, "What you have is an artificial sense of poetry, art exhibits, and the formal side of it. Your sense of romance and poetry is an artificial one. You're the kind of person who wouldn't have clapped for Tinker Bell." Here the contrast extends to the psychology that drives them. It's an understanding of their emotional lives, their fears, their vulnerabilities that opens up these characters to audiences, helping them see past the persona to something-perhaps some hurt, some tenderness-underneath. ............... How Do Characters Change Each Other? It's not unusual to hear an executive or producer ask, "Does the character change and grow?" Some of the strongest stories show the impact that one character can have on another. ...In a television series if the characters were totally transformed, the dynamic of the series would be destroyed. As a result, changes are minimal. In films or novel, conflicts can be resolved and transformations can be completed by the end of the story.